3 Keys To Effectivelly Escaping Grab Attacks? Every student of self-defense and martial arts should learn how to deal with a grab attack. For some though, the prospect of letting an attacker get close enough to take hold of you isn't pleasant in the least. But, if we can stay focused on scientific principles, we can see that there are only three key points that we need for controlling a self-defense situation where we're being grabbed by our assailant. ...there are too many variables. You have all of these possibilities without even looking at the grab-and-punch or grab-and-kick scenario. So, how can you learn to handle these types of self-defense situations without memorizing a ton of techniques? The problem is that most students, and teachers for that matter, tend to think mechanically when it comes to learning self-defense. But, if you're going to develop any level of mastery with your skills, you're going to have to start thinking on a strategic level. What that means is this: You're going to have to look at principles and ideas, rather than specific details. When dealing with an assailant who launches a grabbing attack, you need to stay focused on three important elements. If you've done your prep work and learned more than just a bunch of pre-rehearsed techniques or kata "examples," you should be just fine. Think outside the box. Unfortunately, most of us were raised in a society focused heavily on sports, competition, and "fair play." Avoid the common tendancy to want to wrestle with a wrestler. What that means is this - avoid the tendancy to grab him because he's grabbing you. You must have other skills and techniques that you can use to get him off of you. Use leverage and attack weak-points rather than relying on strength. Learn the skill of using strong-points against weak ones as outlined in Sun Tsu's "Art of War." A little study about how the body works, specifically how and where it's strong and the same for how it's weak, will go a long way toward being able to escape from a bigger, stronger opponent. Remain covered. Boxers, and martial artists who focus on punching and kicking, know the importance of covering their targets against the possibility of incoming blows. Wrestlers tend to forget or, worse yet, never learn this. But, you must remember that a self-defense situation is NOT a sport competition where you are both limited by a set of rules to doing the same things to each other. Just because you can execute that wrist-grab escape, doesn't mean that you've also eliminated potential targets for him to hit with his follow-up attack. Keep these keys in mind when you're training, and make sure that you're learning from someone who does the same. There's much more to defending against a brutal attacker than simply executing a textbook perfect self-defense move. Go ahead and learn the cool moves. But also make sure that you're learning how to think strategically. Thinking strategically is one of the marks of a true master. 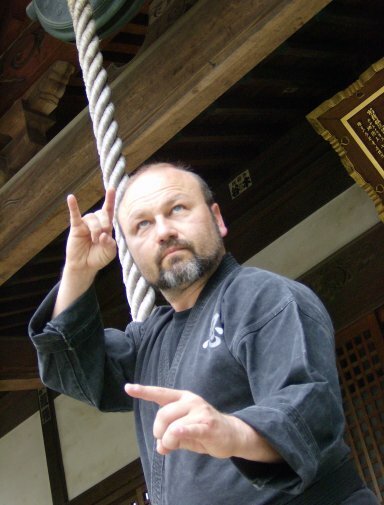 Regardless of whether your focus is on martial arts, ninja training, or whatever... if your goal is real-world self-defense skills, then you need to avoid falling for the Karate-Myth. Immerse yourself in the art of Japan's ancient Ninja Warriors from 8pm Friday evening, through 5pm Sunday afternoon for a weekend of training in the Ninja's self-protection and life-enhancement skills! The camp is open to all teen an adult students (under 18 must have signed permission from a parent or legal guardian), serious about studying the "Way of the Shinobi Warrior!" IMPORTANT REMINDER Due to my ongoing recovery from my accident, I am unable to do the traditional camp setting that is advertised on the web site. We will be holding the camp at the WCI main Dojo in Sunbury, Pa and then using the academy and several outdoor venues for the actual training. As a result, we will not be able to provide the meals and lodging (unless you want to bring a bedroll and sleep in the dojo), so I am locking the tuition in at $125 . If you need information about local hotels, please let us know when you register. The focus of this year's O-Matsuri `Festival`, are the skills, tactics, philosophy, and techniques of the Togakure-Ryu (`School of the Concealing Door`) Ninja. Kuden Radio Show - Episode 2 Is Ready! That's right! KUDEN, my all new online radio show went live on Wednesday, August 20th, 2008! All you have to do to get access and listen in to each episode is to subscribe using the form on the online ninja training page. Subscribers to the list get first notification of each episode before we announce it to the world! They also get updated information and training tips related to the topics being discussed in each podcast. Of course, you don't have to subscribe and get early notification. You can just go to: http://kuden.mypodcast.com and download the latest episode. If any of the links don't work for you, just copy and paste it into your browser.